My university closed for the Christmas break last Friday. As everyone knows, this means nothing for PhD students. Generally you are too busy to easily justify taking a few weeks off. And even if you do convince yourself to have some down time over the holidays, you will still risk being hit with PhD Lifestyle Guilt. Plus sometimes it’s just hard to get in the Christmas spirit. 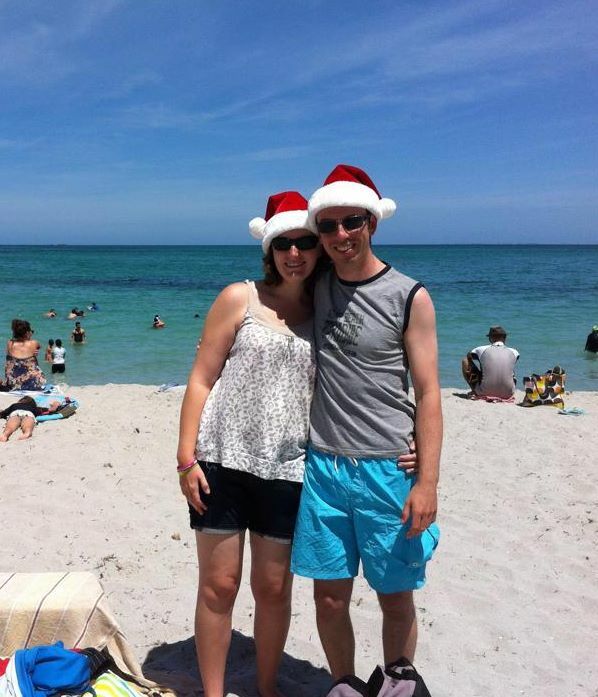 As a Northern Hemispherean, I find an Australian Christmas hard to adjust to. Every little fragment of my DNA is screaming that it should be cold, dark, and snowy – i.e. perfect weather to wrap-up in woolly jumpers, drink hot (possibly alcoholic) beverages, and eat plenty of mince pies to ensure survival through the winter. So to be confronted with these same urges whilst sweltering through a 40° Celsius, sun-filled afternoon is pretty confusing. An additional problem is the PhD budget. Although we live pretty comfortably, there isn’t a whole lot of extra cash floating around at the best of times, especially not to be spent on decorations which only make an appearance once a year. This weekend I spent some time Googling “Christmas Crafts for Kids” (because I’m aware of my own craft skill level). I found some pretty cool sites (such as Kid Spot Christmas), and thought I’d give it a whirl! The result is that I’ve now spent most of the morning improving my multi-tasking abilities by combining uni work with simple crafts. 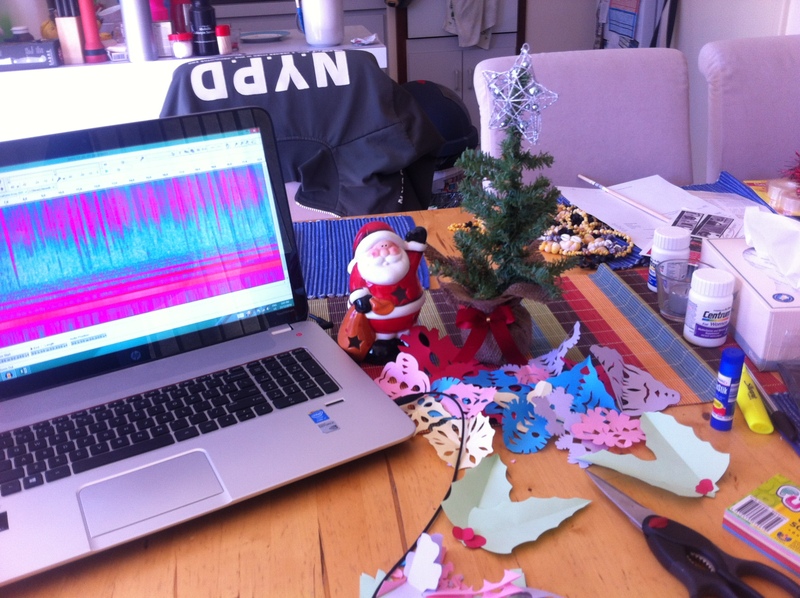 Multi-tasking acoustic research with cutting paper snowflakes! For instance, I’m currently going through hundreds of acoustic files from the Swan River to see what I can hear (for the record, a LOT of snapping shrimp). This means that my ears are busy, my hands are idle, and my brain is floating somewhere in the middle. So whilst listening to my recordings this morning, I also started cutting out dozens of paper snowflakes. At $2 for 180 small sheets of coloured paper, it’s a bargain and a time-saver! These will eventually get strung up all over the house. I also spent some time faffing around with glitter, but this came to a halt when I sneezed suddenly and managed to inhale a large amount of it. Like I said, I know my craft skill level. So teamed with a few yards of discounted tinsel, our pint-sized Christmas tree, and a few (surprisingly neatly wrapped) presents, it’s starting to feel pretty festive in here! Especially if you turn on the air-conditioning and your imagination. This is all greeted with a certain amount of suspicion from Phil (he still hasn’t forgotten our first festive season together, when I decorated the house with miles of tinsel then insisted on leaving it up until April). But thankfully nowadays he only gives a single heart-felt sigh of resignation before assisting me with whatever new project has popped into my head. This entry was posted in Personal, PhD Life and tagged Australian Life, Budget, Christmas, Crafts, PhD, Postgraduate, Research on December 22, 2014 by Sarah Marley. Thanks for stopping by on my blog! My husband is an Australian and we lived there for a few years before an academic job (his) brought us back to the Great White North. I was never, ever able to reconcile summer with Christmas either. Best of luck with your PhD- hopefully you’ll be more prepared for the post-defense slump than I was. It’s pretty shocking right? One of the weirdest things for me (apart from the heat) is being out in public, surrounded by people on Christmas Day. So used to just scurrying between house and car whilst visiting immediate family! Have a lovely festive season!